Marie Sizun’s Le Père de la petite (His Father’s Daughter) takes us to Paris during the Second World War, where a young girl lives alone with her mother in a small apartment. Hers is a rather sheltered life, with only the occasional visit from her stern grandmother, and she has been allowed to do as she pleases, drawing on walls and leaving the dining table in the middle of meals. Spending virtually all of her time with her mother, ‘la petite’ (the little one) is naturally fiercely attached to her, resenting any attempt to separate them, even for a few hours. 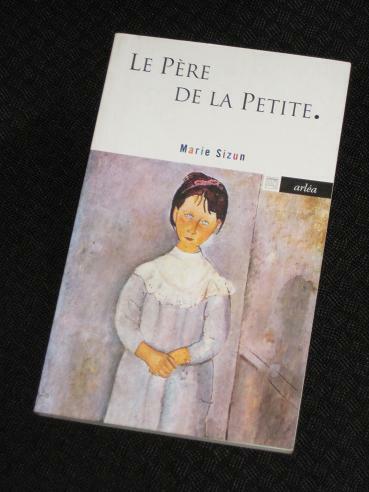 For a first novel, Le Père de la petite is an impressive work, but considering that Sizun was a professor of literature at universities in several countries before she wrote the book (which was published when she was sixty-five years old! ), that shouldn’t come as too much of a surprise. The author examines a family reunion through the eyes of a little girl struggling to cope both with her own emotions and those of her parents, whose feelings she has to piece together from what little she is told, or overhears. Ma chérie, elle baisse le nez, penaude, murmurant on ne sait quoi, humble, comme honteuse. Elle capitule, elle se soumet, elle passe à l’ennemi. Voici que la mère n’est plus la championne de la petite, de sa petite. Elle n’est plus la mère complice qui se moquait des reproches de la grand-mère. La mère est du côté de cet homme en colère. Du côté de son mari. My dear, she lowers her head, penitent, murmuring something randomly, humble, as if ashamed. She surrenders, she submits, she goes over to the enemy. The mother is no longer the champion of the little one, her little one. She is no longer the accomplice who laughed off grand-mother’s reproaches. Mother is on the side of this angry man. On the side of her husband. The tight bond between mother and child loosens overnight, leaving the little one distraught and alone in her confusion. In fact, it’s now the mother who feels like the third wheel. Le Père de la petite is, as you can imagine, a story mainly concerned with relationships, and Sizun spends much of her time on the problems that can develop in them. The initial concern is with how the child will adapt to her father’s presence, and the writer carefully introduces a man whose war-time experiences have made him unfit for domestic life. The rigours of life as a prisoner-of-war have taken their toll, meaning that he is unable to bear the slightest noise (the child must tread on eggshells constantly). It’s a perfect picture of someone suffering from post-traumatic stress disorder. There are gaps in the story which the child is unable to fill, but the adult reader will be able to tell what is unsaid and predict what is happening (or has happened) in the background. There are echoes here of another of my WIT Month reads, Jenny Erpenbeck’s Wörterbuch, a youthful narrative with hidden stories in the background. While I do read a fair bit of French fiction, both in translation and in the original language, there aren’t that many books by French women on my list. Most prominent among the female writers I’ve read is Marie NDiaye, with Three Strong Women, Self-Portrait in Green and Ladivine all impressive reads, and one of my books of the year in 2015 was Anne Garréta’s Sphinx, a gender-defying novel released by Deep Vellum. One of the discoveries of this year’s Man Booker International Prize reading was Maylis de Kerangal’s Mend the Living (the US edition uses the title The Heart), and I also liked Yasmina Reza’s relationship comedy, Happy are the Happy. However, to say I enjoyed Véronique Olmi’s Beside the Sea (another Peirene book) would be in bad taste (those who’ve read it will know exactly what I mean…).